Congratulations to the wrestling team with 3 Regional Champions – team captains David Winters (’19-Hanover) and Cole Cummins (’19-Chesterfield), plus freshman RJ May (Powhatan). 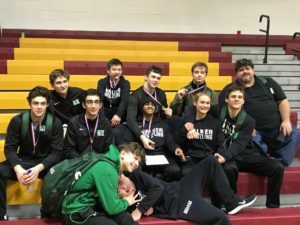 Other State qualifiers are Zach Wooden (’22-Henrico), Varun Mandgi (’21-Henrico), Ashton Longo (’19-Richmond) and Will Street (’21-Henrico). Good luck to the 7 wrestlers competing at the state champtionship Feb 15-16.